Northern Ireland’s Department for Infrastructure has invested £90m in the BRT scheme, which is being operated by Translink – a collaboration between Citybus, Ulsterbus and Northern Ireland Railways. Construction began on the system back in 2014, with the service initially expected to begin in 2017 – although the opening was delayed following budget restrictions. The single-articulated Van Hool Exquicity 18 is the vehicle of choice for the new service. Originally launched by the Belgian manufacturer in 2011, the Exquicity has been used elsewhere in Parma, Italy and Metz, France. David Sterling, Head of the Northern Ireland Civil Service said at the launch: “The Belfast Rapid Transit Glider service is all about customers and connectivity. “It offers an enhanced customer experience and a joined up service. “The current patterns of transport and our dependency on the private car are simply not sustainable. “Working together we can reduce emissions and congestion levels. “That’s why we have a very clear commitment in our Outcomes Delivery Plan to increase the percentage of journeys we make by public transport, walking and cycling. “The new Glider service will offer quick, modern and efficient access into and across the city. Chris Conway, Translink Group Chief Executive, said: “We’re transforming local public transport, providing modern, efficient services, vital for our economy to prosper, for social inclusion and the environment. “With a record 81 million passenger journeys delivered last year, the highest in 20 years, Glider is a further significant step towards making public transport your first choice for travel in Northern Ireland. “Glider is the new face of public transport in Belfast. “The Eco Hybrid vehicles will help improve air quality in the city and can each carry up to 105 passengers, offering convenient features like free Wi-Fi and USB charging facilities. “The new off-board ticketing system will facilitate faster journeys and offer the same excellent value tickets as Metro. “I’d like to pay tribute to everyone for your interest, enthusiasm, patience and support. “We now look forward to welcoming all our customers on board their new Glider service from Monday,” said Chris. 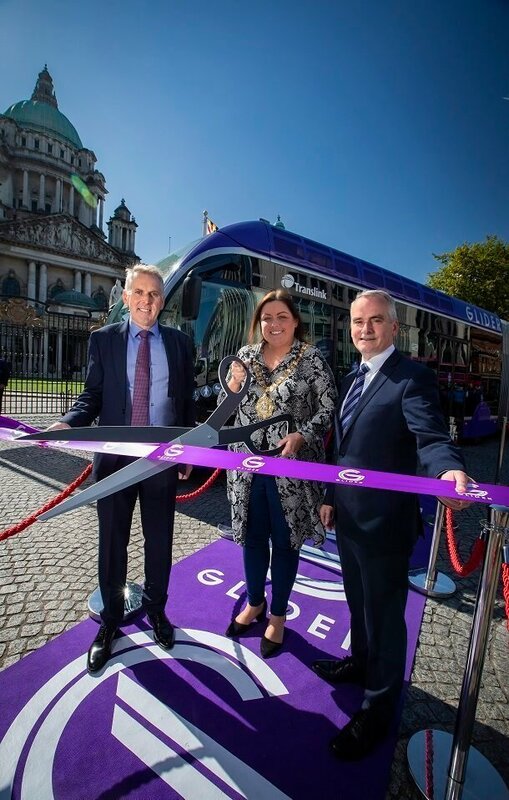 The Lord Mayor of Belfast, Councillor Deirdre Hargey, added: “The introduction of the Glider is good news for Belfast and for Belfast City Council – it will help us as we work to achieve the aims of our Belfast Agenda the long-term development plan for the city. “By 2035, our council aims to increase the number of residents in Belfast by 70,000, and create 50,000 more jobs. “Fast, efficient public transport is vital to the success of the Belfast Agenda ensuring people can move freely and easily across the city.